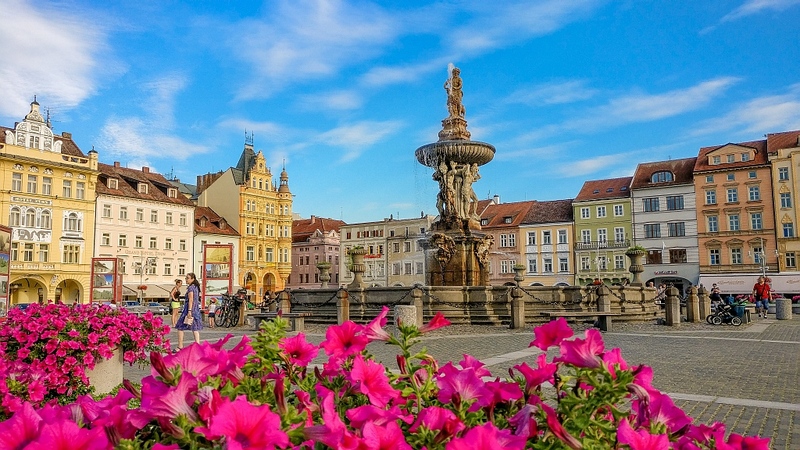 Yes, Prague is beautiful and you should visit the Czech capital, but there are so many places beyond Prague worth visiting in the Czech Republic. It is so cliché to call them hidden gems, but they really are. Recently, I travelled around in South Bohemia and I can’t hide I fell in love with the main city of the region – České Budějovice. I bet you’ve never heard about it. I haven’t either myself before I visited it. Read further to find out how to enjoy České Budějovice, things to do and see and places to visit in or near the town. České Budějovice is a town where people actually live and work and not an open-air museum type of a place where you are done after a walking tour of two hours. This is also why I loved this town – charming and welcoming, still off-the-beaten path, without the mass tourism. It is a real place, with real people. If you are planning to visit the town you should consider staying there at least a couple of days, as this place deserves to be enjoyed slowly. Besides, there’re some great places that you can visit on a day trip from České Budějovice. Read more: Read here my suggestions for a 4-day itinerary in South Bohemia, featuring České Budějovice. 1 How to get to České Budějovice? 5 Where to stay in České Budějovice? How to get to České Budějovice? From Prague there are direct buses and trains, which depart each hour and it takes about 2 hrs to get to České Budějovice both by train and by bus. If you are travelling by car it will be less than 2 hrs. For buses, check the website of RegioJet and for trains the Czech Railways. I used the services of RegioJet and I found them comfortable, reliable and fast. There was however one downside, they depart from Na Knížecí – a bus station that’s far from the Prague’s Main Railway Station. It takes about 30 minutes by public transport to get from the main railway station in Prague to Na Knížecí. You should consider this when you plan your trip to České Budějovice. It’s a bit complicated to get from Vaclav Havel Airport to Na Knížecí by public transport – you need to change at least two times and it will take you about an hour. However, you can always use Uber or a regular taxi to get around in Prague and the prices are affordable, but not if you travel on budget. Tip: If you fly into Prague and want to go immediately to České Budějovice, do this by train. If you prefer to use the bus, there’s also a direct connection between the Main Railway Station and České Budějovice operated by FlixBus. České Budějovice was founded in 1265 by the Bohemian King Ottokar II (Přemysl Otakar II in Czech) and soon became one of the most important walled cities in Bohemia. It has a pretty unique location – at the confluence of the biggest river in Czech Republic – Vltava and the Malše River. By the 16th and the beginning of the 17th centuries the town reached its economical and cultural peak. Unfortunately, the big fire in 1641 destroyed a great deal of the city and stopped its development. It wasn’t before the 18th century when the city began to gain importance again. By the end of the 19th century the majority of the population in the city was German-speaking from Bavarian descend. This is also why you may encounter the German name of the town – Budweis. After WWII, however, the German speaking population was expelled from the city by the communist regime. There’s something for everyone in České Budějovice. If you are a beer lover – you should do the beer tour of Budweiser Budvar Brewery. Are you a history geek – the old town offers a good deal of historical sites. Do you just want to relax an enjoy your time – take a rowing boat on the Vltava River or go picnicking in the Stromovka Park. How about getting a bit active – grab one of the purple bikes and discover the city and its surroundings. As České Budějovice is a student city (the University of South Bohemia is located there), there’s this special vibe in the city that makes it look so young and thriving despite the thick layers of history. All historical and cultural attractions in České Budějovice are in or near the old town. So the best way to explore the city is by walking. You will be surprised how big is the city’s square Přemysl Otakar II, named after the founder of city. It’s a lovely place to hang out around. On four sides it’s lined up with arcades and beautiful Renaissance and Baroque buildings. At night the square is magical – all buildings and the fountain are beautifully lit up. The eye-catcher of the square is without a doubt the Samson Fountain that proudly stands in the middle. The fountain was erected there at the beginning of the 18th century. It’s a lovely sculpture dedicated to the myth of Samson who fought with the lion. After the reconstruction in 1999 the original sculptures of the fountain were substituted with copies. The originals can be seen in the Town Hall, which is one more reason to visit this beautiful Baroque building. The Town Hall was originally built in the 16th century but fully reconstructed in the 1720-s in Baroque style. The four statues on the roof represent allegories of the cardinal virtues: Prudence, Fortitude, Temperance and Justice. You can visit the old town hall and its observation deck with a tour which you can book via the Information Tourist Centre, located on the ground floor of the building. In 1995 the Town Hall got a lovely carillon which can play up to 80 melodies. The cityscape of České Budějovice is dominated by the Black Tower – a watch tower built in the 16th century which also serves as a belfry for the nearby St. Nicholas Church. Today, you can climb the 225 steps to the top of the tower and enjoy a beautiful view of the city and its surroundings. The tower got its name in the 18th century because it was turning black as its maintenance was neglected. Next to the Black Tower is the St. Nicholas Cathedral. The initial church, built on the place of a 13th century Gothic church, was destroyed during the big fire of 1641. The reconstruction of the church started immediately after and was completed in 1649. The Cathedral is the seat of the Roman Catholic Diocese of České Budějovice founded in 1785. Not the heavy-metal band of course. Although the band and the tower were named after a medieval torture device which supposedly was found in the tower. The Iron Maiden tower is a part of the old city walls and fortifications and was built in the 14th century. The half-timbered water tower is located just outside of the city walls. It was built in the 1720s to supply the Samson Fountain with water from the Vltava River. The tower was recently restored, and it can be visited with a guided tour. You need to book a tour via this website in order to be able to visit the tower. Tours are also available in English. Tip: As the website is only in Czech, my advice is to go to the Tourist Information Centre. They can assist you there with the booking. The Dominican Monastery and the Church of Presentation of Virgin Mary belong to the oldest buildings in České Budějovice. They were built around or before 1265 when King Ottokar II of Bohemia founded the city. The monastery has a very well preserved Gothic cloister. At the end of the 18th century the monastery was taken by the Piarists, who were followed by the Redemptionists at the end of the 19th century. The square in front of the church (Piarist Square) used to be the city’s cemetery. Today there’s a cross as a remembrance of this. Not the diamond, of course. I was surprised to find out that the all those lovely colouring pencils I had as a kid, were coming from this town. Koh-i-Noor Hardmooth is one of the largest producers of stationery articles in the world – pencils, pens, water colours, erasers. Tip: Do you want an original souvenir or a present from your trip to České Budějovice? Visit the Koh-i-Noor shop on Široká Street 421/1 and choose a set of pencils, for example. When wandering the streets of České Budějovice watch out for those weird installations and sculptures. They are part of the Art in the City Festival which takes place each summer in the city and other places in South Bohemia. I loved to discover them everywhere. Whether or not you are a beer lover, the brewery tour is one of the must-dos in České Budějovice. The history of the brewery is interconnected with the history of the city. Besides you will learn how beer is made and you will visit the production facilities, which are pretty impressive. And of course, there will be some beer tasting involved, as well. Adults – 120 CZK including the tour and the beer tasting. Tours need to be booked in advance, min. 5 persons. Each day at 2 pm there is a regular tour, and in the summer (July & August) at 11 am, which do not require prior booking. Visit the website of the tour. Tip: After you have done the brewery tour, finish the day with a dinner at the Masné krámy Restaurant. Located in the historical building of a former meat market, the restaurant serves the local Budweiser Budvar beer and traditional Czech cuisine. With the two rivers coming together at the city, České Budějovice is perfect for some boating. Or you can take a boat trip on the Vltava River all the way to Týn nad Vltavou and the Mitrowicz Castle or to Hluboká nad Vltavou and the Hluboká Castle. You wanna bike around? České Budějovice will surprise you with the bike trails available. The city offers the biking share services of Rekola (the purple bikes), so it’s easy to just hop on one. You can discover the city on a bike or take one of the bike trails in the surroundings. You will find here and here more info about the bike trails. The biggest park in the city is Stromovka. It’s a lovely place to go for a walk or if you want to get more active, you can play some disc golf there. What I loved about České Budějovice, is that there’s a lot of greenery along the rivers and everywhere outside of the old town there are small greens and parks. České Budějovice is not a place for one day. There are also so many things to do and see around it! The city can serve as the perfect base to discover the South Bohemian Region of Czech Republic. You can visit the UNESCO World Heritage Sites Holašovice and Český Krumlov on a day trip, or the fairy-tale Hluboká Castle. If you love hiking, the Šumava National Park is a perfect place to go for a day hike. Another great idea for a day trip is a boat cruise on the Lipno Lake paired with climbing the Treetop Walkway. Where to stay in České Budějovice? The city offers various types of accommodation to satisfy all needs – from budget hotels and hostels to B&B’s and family-friendly hotels, luxury accommodations and appartments. In general, hotel prices in České Budějovice are affordable and cheaper compared to the prices in Prague, for example. Grand Hotel Zvon – this 4-star hotel is located on the city square Přemysl Otakar II with splendid views to the square, the fountain and the town hall. The hotel has also an excellent restaurant serving traditional Czech cuisine. They also have appartments which is perfect if you are travelling as a family with kids. The prices vary depending on the type of the room, so you should check below for the best options, which can be quite affordable. Check prices and availability of Grand Hotel Zvon. U Solné Brány Boutique Hotel – a charming 3-star hotel located at the edge of the historical centre behind the Town Hall with stylishly furnished and comfortable rooms. Check prices and availability of U Solné Brány Boutique Hotel. Hotel Budweis – the hotel is situated in a historical building of a former mill, which is beautifully restored. It offers comfy rooms, great service and of course perfect location – at the corner of the historical centre on the Malše River. I’ve stayed there during my visit in the city and I loved it. Check prices and availability of Hotel Budweis. I have visited České Budějovice as a part of press trip, organized by the South Bohemian Tourism Board on invitation by Czech Tourism, where all accommodation, meals and activities were provided by the Tourism Board and their partners. However, all opinions expressed in this post are mine. Fancy visiting the place, pin this for later! Have you been to České Budějovice? Did you like it there? What’s your favourite spot in this beautiful city? Mine is for sure the square with the fountain. I couldn’t stop taking pictures of it. Do you have further questions about what things to do in České Budějovice? Let me know in the comments and I’ll try to help you.